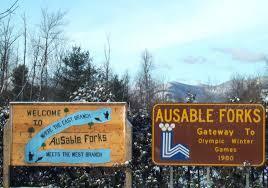 The AuSable River main stem comes together in Au Sable Forks where the East and West Branches converge on their way to Lake Champlain . Fishing the main branch can be good if you do a bit of searching for the locations where there is deeper water. Most of the river flows through comunities and access is limited, but availible. use the PFR map for ease of access. The river is navigable water, so tubes, canoes, and pontune boats are the best way to explore the best parts of the river system without the worry of access. The East Branch of the Ausable River, above and below the town of Ausable Forks, is where you can find thicker pocket water sections that hold trout. 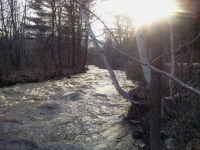 This same river in the town of Keene offers a bit more opportunity as well. Far too often anglers miss these areas as the East Branch stands in the shadows the West Branch. The Boquet River is known for its Atlantic Salmon runs which migrate in the spring and fall up River some 12 miles to the falls at Wadhams. Brown trout and steelhead also migrate upriver from the lake. The river moves fast and tumbles more than 40 miles before entering Lake Champlain with pockets and hard-pushing classic salmon pools. Wading staffs are recommended. Willsboro Dam Removal Project - The Dam and the fish ladder were removed in 2015. Fishing is still prohibited from route 22 bridge down to the pool below it. The best angling perhaps is the larger pool below the ledges and down to around the bend to where the water flattens out and becomes slow. Below that it is best to get your small boat or canoe to troll your flies. Be sure to get familiar with the salmon regulations for the fall. There is a no supplemental weight rule , from June 15 through Dec 31. Don't get caught using any weight on your flies or leaders during this time. Swinging flies on the standard leader is typically the best method. The Chateaugay River is gorgeous and slippery, dropping through several waterfalls in Franklin County on its way to Canada. Rainbows predominate above the bridge on Route 11. Browns can be found too. 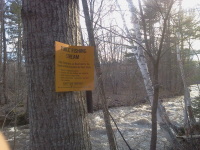 Public fishing rights are located along Route 11. 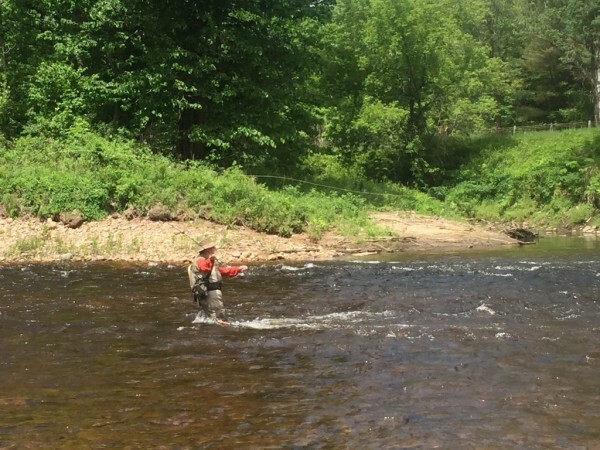 The North Branch Great Chazy River is stocked with brook and brown trout. Rainbow Trout are also available in the North Branch. Parking opportunities are plentiful with miles of public fishing rights between Moores Forks and Ellenburg Center on Rt 11.
eastward, emptying into northern Lake Champlain in the Town of Champlain. The more northerly river is the Great Chazy River, which empties into Lake Champlain at King Bay in the Town of Champlain. 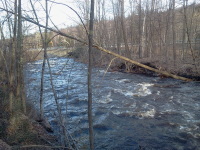 The more southerly river is the Little Chazy River, which empties into Lake Champlain north of Chazy Landing in the Town of Chazy. 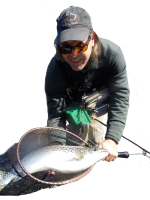 The North Branch Great Chazy River is annually stocked with over 8,000 brook and brown trout. Rainbow Trout can also be found in the North Branch. The Salmon River flows through northern Franklin County, NY. Beginning below the dam in Chasm Falls is an excellent trout fishery, containing many deep pools and plenty of pocket water. A recently established catch and release section can be found north of Malone. There are numerous access points along this stretch, including bridges in Chasm Falls (Titus Mt. road), Whippleville, Malone, and Westville. Stocked annually by the DEC, the river is ideal for holdover fish. A good stretch above Alder Brook along Rt 3 remains relatively un-fished partially due to needed bushwhacking. 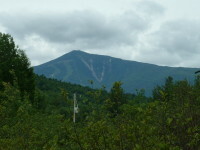 True Brook is a stream located in the town of Saranac, in Clinton County, in the state of New York. Anglers will find a variety of fish including brown trout and brook trout here. Throughout True Brook, you will find numerous trout swimming. It is a small stream that requires stealth and persistence. You approach will be critical to your success.